Wide Tire Conversion Kits - Turn Your Ordinary Bike Into A Beast In No Time. Make you bike a badass ride with wide tire conversion kits! Wide rear tires are the rage today when it comes to choppers. However, some stock motorcycles have two tires of the same size. If you want to change to the new wide tire look, you can do it with a conversion kit. Of course, you'll need to purchase the wide tire, and depending on the kit you choose, you will probably need a new, wider rear fender unless you want an old school bobber look. But the conversion kit will have everything else you need to make the change successful. You could buy the parts ala carte, but why bother when you can get a wide tire conversion kit that has everything you need to make the change on a weekend. Amateur Video Of A Wide Tire Conversion. 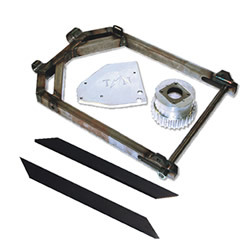 A wide tire conversion kit often contains the wider swing arm, axel, primary spacers, and other hardware required to install the kit. Some kits will include a wide fender that is ready to paint or even the tire in the size you desire. Few, if any, wide tire conversion kits will include the rear wheel, not even those which provide the fender and tire, but some may include a rear shock. It may seem as if wide tires have only been popular for the last decade, but in reality, the process began much longer ago than you probably expect. Men returning from World War II who loved motorcycles wanted to turn their new bikes into leaner meaner machines. Many of these soldiers had first begun riding while in the war. 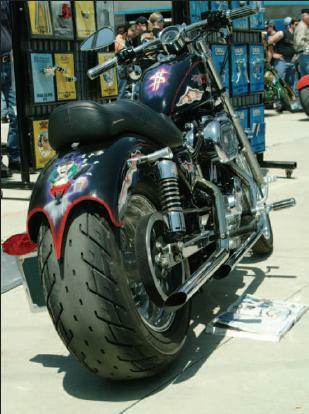 Some of these bikers customized their bikes by adapting a car tire to the rear to get the first fat tire look. One version of the history of the wide tire conversions indicates that at age 16 Gary Chipp, a son of the owner of C&C Cycle in Iowa, bet his father he could modify an Electra Glide from to accept a 240 series tire and still be able to use the factory saddlebags on the cycle. He was able to win the bet. This was a major change from the 140 tires that had been standard previously. Today, the 300 series tires are very popular for creating the rear fat tire look. You can install the wide tire conversion kit yourself for the most part or you can have your local motorcycle professional tackle the job for you. Wide tire conversion kits are easy to find online. Also, your local shop can order them for you. But be sure you get a full listing of all the parts you will get with your order. We have a lot of Sportster owners who may want this 240 conversion kit. You can get it at Teja Thump Cycles. This particular kit is for a 1991 - 2003 Sporty. According to Teja the installation of this wide tire kit takes just five hours, not including painting and finishing. In order to get this installed you'll need to take off your stock Sportster fenders and put new ones on. But you'll be able to utilize the brakes and possibly your current shocks. If you have 11 inch Progressives or the XL883 Huggers (stock), then you can. They are asking $999 for this kit not including shipping/handling. They also have a kit for a 2004 - 2006 Sportster. 'Building A Chopper Chassis' by Ron Covell is the most comprehensive, instructional DVD on building a solid chopper frame available today. This DVD is 70 minutes, and every minute is loaded custom frame building tips and insider secrets. Click here for more information on this amazing DVD.